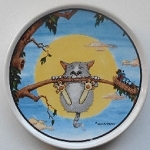 This holiday cat plate was designed by Warren Kimble. 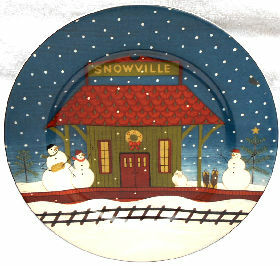 It features "snow people" and a "snow cat" waiting on a railroad platform. The stoneware plate is 8" in diameter. The plate is dishwasher & microwave safe. Manufactured by Sakura. Previously owned but in good condition.